Matt’s Movie Reviews, on behalf of Walt Disney Pictures Australia, is proud to give you the chance to win a double-pass to see the family adventure Dumbo! 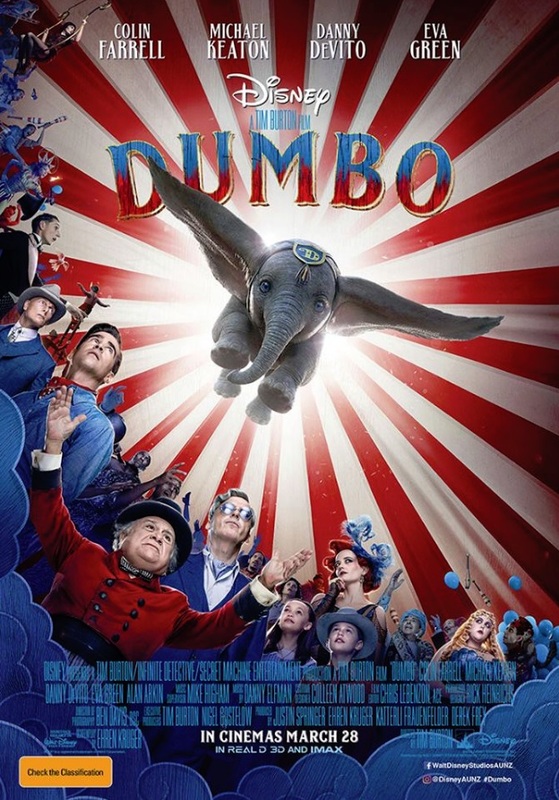 "Circus owner Max Medici (Danny DeVito) enlists former star Holt Farrier (Colin Farrell) and his children Milly (Nico Parker) and Joe (Finley Hobbins) to care for a newborn elephant whose oversized ears make him a laughingstock in an already struggling circus. But when they discover that Dumbo can fly, the circus makes an incredible comeback, attracting persuasive entrepreneur V.A. Vandevere (Michael Keaton), who recruits the peculiar pachyderm for his newest, larger-than-life entertainment venture, Dreamland. Dumbo soars to new heights alongside a charming and spectacular aerial artist, Colette Marchant (Eva Green), until Holt learns that beneath its shiny veneer, Dreamland is full of dark secrets." 1) Write in 25 words: Who is your favourite Tim Burton movie and why? Giveaway offer ends Sunday the 24th of March, 2019!! !